Symptom: near vision becomes gradually blurred with age. It is necessary to move away the text to read, and then reading small letters is impossible without suitable glasses. Besides, reading with bad light conditions is difficult, and even impossible. Cause: the loss of the power of accommodation results from the ageing of the crystalline lens occurring after age 45. 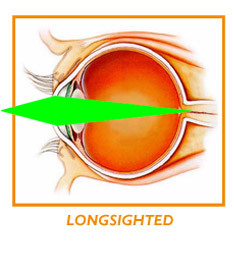 Treatment: presbyopia is corrected by wearing glasses fitted with converging glasses or contact glasses. 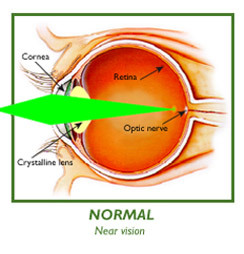 By using laser on various areas of the cornea, it is possible to make it multifocal, which allows good vision at all distances. Other techniques are also available.